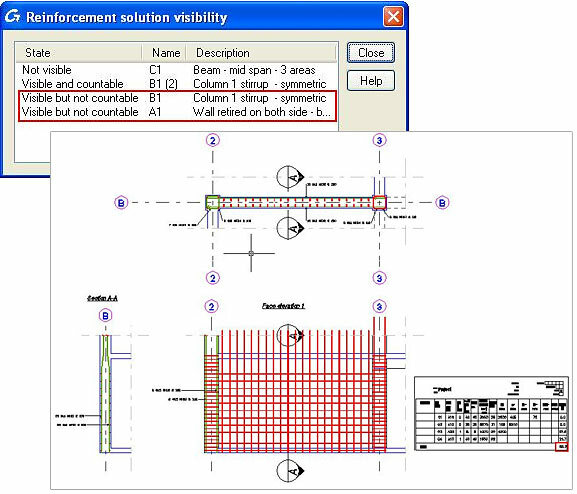 To obtain more explicit and easy to read reinforcement drawings, Advance Concrete provides the "Solution visibility properties" option. 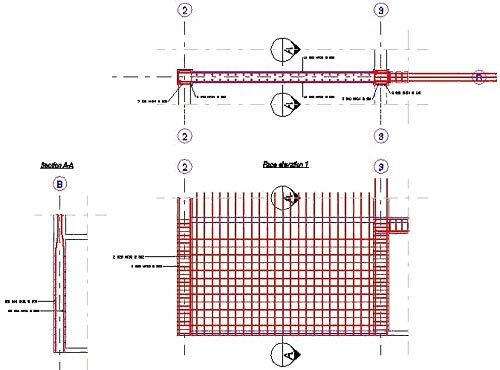 This option helps to avoid the display of the reinforcement of adjacent structural elements that are detailed in other reinforcement drawings. In many cases the structural elements are detailed in reinforcement drawings sorted after the structural element type, for example: Reinforcement for beams, reinforcement for corner columns, reinforcement for slabs, etc. Advance Concrete provides the option to use dynamic reinforcement solutions depending on the type of the structural element. In this example, a dynamic reinforcement solution will be applied for the intersection of 3 different structural elements (wall, column, and beam). On the wall, the "Walls retired on both sides - between columns" dynamic solution will be applied. For the columns the "Column 1 stirrup - symmetric" solution will be applied and for the beam the "Beam - mid span - 3 areas" solution will be applied. 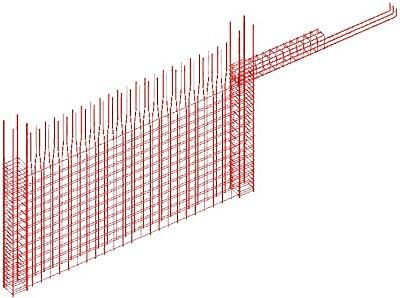 Generate a reinforcement drawing for the wall and for the 2 columns from its ends. After the reinforcement drawing is generated, it is easy to see that the reinforcement from the beam is present in the reinforcement drawing of the wall. This situation is caused by the method of applying the dynamic reinforcement solutions. The beam and the wall dynamic reinforcement solutions were applied by taking the adjacent column into account. The column from axis 3 is common for both the dynamic reinforcement solutions. Because of this, even if the beam is not selected to be included in the reinforcement drawing, the beam reinforcements are visible on it. For better control over the dynamic reinforcement solutions in a reinforcement drawing, Advance Concrete provides the "Solution visibility properties" option. 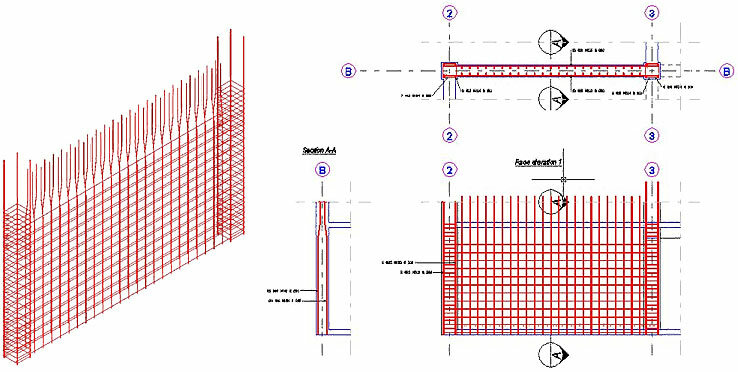 This option allows you to choose which dynamic reinforcement solutions should be visible on the reinforcement drawing. 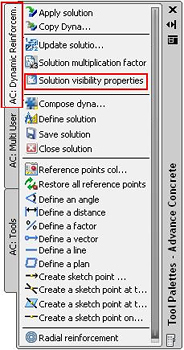 This option can be accessed from the "Tool palettes", from the "AC: Dynamic Reinforcement" tab and from the "Advance reinforcement solutions" toolbar. The option is available only in the "Drawings" mode. When the "Solution visibility properties" option is used, a dialog box appears with the default settings. This dialog box lists all the dynamic reinforcement solutions applied for all the adjacent structural elements. It is easy to see that the "Beam - mid span - 3 areas" solution is visible for the reinforcement drawing. 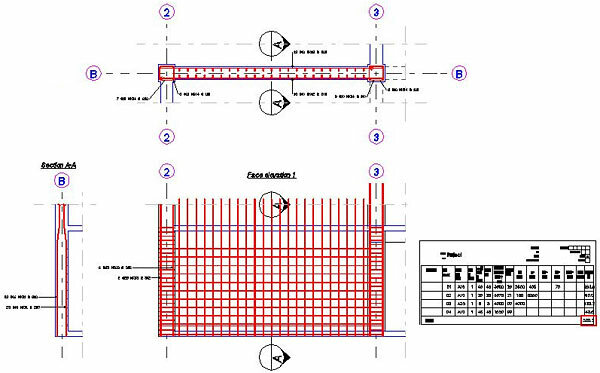 To hide the beam reinforcement for this reinforcement drawing, for the "Beam - mid span - 3 areas" dynamic reinforcement solution applied on the C1 column, select the "Not visible" option. After the settings from the "Solution visibility properties" are validated the reinforcement drawing is modified without using the "Activate and update" command. Other settings for this option are "Visible and countable" and "Visible but not countable". The "Visible and countable" option is used when you want all the reinforcements to be visible and to be included in the same list. For example we will consider the wall and the 2 adjacent columns that usually are detailed in the same reinforcement drawing and in the same list. If the column reinforcement were included in another reinforcement list and you want to make them visible in the wall reinforcement drawing but do not want to include them in the wall list, for the columns dynamic reinforcement apply the "Visible but not countable" option.